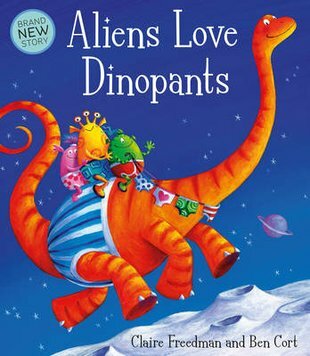 Aliens love pants! Dinosaurs love pants! But do aliens and dinos love each other? A funny rhyme about pants – and sharing! The bad news: the alien have crash-landed in the jungle. BUMP. The good news: they’ve just found the biggest stash of pants EVER! The aliens can’t wait to party in all these nifty pants. But then their prehistoric owners show up! Will the aliens and dinos fight it out? Or will they buddy up and have a cool adventure in space? A glance at the cover picture might give you a clue. Read this silly rhyme for the whole story!